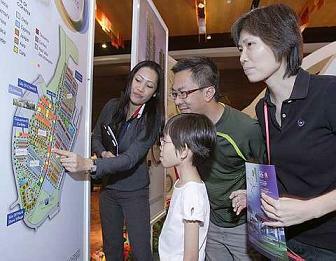 Landed homes in Penang are still in great demand despite their high prices. SP Setia Bhd’s sales and marketing executive Eunice Lee said many people were eyeing Penang landed property due to expected limited and costlier supply in future. “We have sales every day for our Setia Greens and Setia Pearl Island projects comprising terrace and semi-detached and villa units,” she said. She said the number of visitors to the fair had been “fantastic”, especially during the weekend. BSG Property’s sales and marketing executive Chong Hock Aun said the company was getting more enquiries on the landed segment as visitors felt that such property were likely to be more expensive if they did not buy them now. Chong said there seemed to be more young couples who visited the fair during the weekend while older folk were the bigger crowd on the first two days. Ideal Homes Properties Sdn Bhd sales and marketing manager Teh Yeow Jin said many visitors preferred landed property but their prices were generally out of reach.